Lean Manufacturing vs. Lean Startups: Business Ethos or Business Buzzword? Having spent the last twelve years of my life studying and applying lean methodologies in production and corporate environments, I was surprised upon arriving at HBS that the language of Lean had become a fundamental part of entrepreneurship in this community. In a manufacturing environment, labels didn’t matter (call it Lean, Six Sigma, TPS, Continuous Improvement, HMM, etc.) and mindset was everything. At the end of the day, the goal was the relentless pursuit of eliminating waste best expressed as a “zero loss” mentality. This impossible ideal focuses an organization on profitable customer value creation above all else. However, what I observed at times was the danger of taking process frameworks, arming people with tools and verbage, and unleashing them upon organizations. The end result is a rigid and sterile outcome that only superficially mimics the intent of the process improvement rather than genuinely applying it. For example, a workplace organization process that is often used is 5S (sorting, set in order, systematic cleaning, standardizing, and sustaining). This process has real value in many manufacturing environments where having tools, material safety sheets, emergency equipment, etc. readily and consistently available at hand is critical to operations. However, many overly enthusiastic Six Sigma black belt aspirants take this “letter of the law” approach to process tools which results in tape outlines being placed on desks for staplers which have been dutifully labelled. When you think about the dozens and dozens of process tools that exist in Lean (e.g. VSM, DMS, PBED, FI, YY, 5S) it is easy to lose sight of the proverbial forest for the acronym-filled trees. This is the danger that I see with the Lean Startup movement. The manufacturing industry has been grappling with Lean techniques and philosophies for the better part of a century and this maturation process has resulted in dogmatic philosophies being replaced by rational and pragmatic thinking along with a healthy dose of self moderation. However, with the Lean Startup, Eric Ries has created something very dangerous. He and others like Steve Blank have codified pragmatic approaches toward efficiently building businesses, borrowed liberally from Lean methodology, created verbage around it, and let the message be spread by small armies of zealous startup people. The end result is FIELD 3. We saw 900 highly intelligent and motivated students talking about “achieving” Minimum Viable Products and congratulating each other on “pivoting”. It’s not our fault. We were led to believe that a magical formula for creating successful businesses had been discovered and we simply had to follow these simple steps to transform any marginal business idea into a runaway success. Now I’m sure that Eric Ries, Steve Blank, and the many professors at HBS cringe each time a wantrapreneur rattles off Lean buzzwords incoherently, but the problem isn’t simply one of dilution of the Lean lexicon but of actual comprehension of the true intent of Lean philosophies. b If no, build something else or quit. 2 What is the cheapest/easiest/quickest way to find out the answer to Question 1? While very similar, the distinction is that Lean Startups has a bit more of a cost-efficient slant to it versus Lean Manufacturing which has more of a process-efficient slant. That makes sense as most manufacturing organizations have financial resources that dwarf that of most startups. However, what is core to both is the customer value proposition and particularly an optimization around revealed preferences (as opposed to expressed preferences). What’s key to note here is that Lean isn’t about simply cutting costs or being cheap but rather deploying resources ONLY in value creating ways. That is a mindset that needs to be part of The Lean Startup movement. 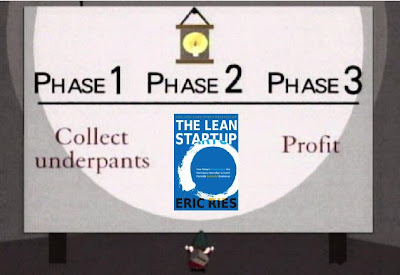 Eric Ries cannot claim to be taking inspiration from Lean Manufacturing while simultaneously claiming that he is incorporating the Scientific Method into building businesses. Lean is certainly not a science because creating value for customers is not a science. Instead, Lean is a mentality or philosophy focused on doing things better every day (continuous improvement), aspiring for zero loss, and serving the customer. That’s exactly the things that startups should be focusing on and that’s the Lean Startup that I aspire to build.